Chicago music scene is back, with various of artists buzzing throughout the city and the nation as well. Its safe to say we can put our hat in the race for the throne with Atlanta and New York. Last year when we dropped list, it was to crown “The New Wave” of artists thats been working to bring attention back to city’s musicians. The 2018 list featured artists such as Juice Wrld and 147 Calboy; two of 2018 biggest break through hip-hop acts. For many that list was their introduction to both Juice Wrld & 147 Calboy. Others first got put on artist such as Saba, Oz, Femdot and more. That list served its purpose, it gave exposure to 25 artists and highlighted the chosen few who are prepared to bring the crown to Chicago. The theme for 2019, is Feed The BUZZ. Many of these Artists have social media BUZZ but not a BUZZ musically. A few of these artists benefited from the BUZZ created by other artists in 2018, which lead to them receiving record deals and more. It is important we highlight them, provide more exposure, and support. We must Champion our artist, our culture and show the industry OUR Chicago. First got wind of WemmyMo at a Fresh Empire event in the south loop, found it quite interesting that the 18 year kid was headlining his own show. The real amazement came when he performed Holy Vibes II and the whole crowd knew his words. Reminds me of a young Chance The Rapper. Asa is probably one of the most consistent artists in the city; his work ethic is amazing. Asa is the one artists that many felt should of been on the New Wave list. I do admit we let Asa slip through the cracks last year, but Asa didn’t let that or anything hold him back. He blessed us with records such as Whip and FUTM. Asa is coming for heads in 2019. David Drake put me on Elvy The God during a El Hitta studio session. This kid is 6ix9ine without the all the antics. Keep your eye out for him, I can see him making a lot of noise. Was just recently put on this kid in 2019, when he did a feature with Lil Zay Osama. Started looking him up, and was amazed. Soundcloud numbers are legit. Its only a matter of time before Cole Bennett finds this kid. One video from Cole Bennett, and its a wrap. The first time I heard Moody is when DJ L sent me some tracks, she can rap. Her voice is amazing, its golden. If you follower her on social media you will see her Cardi B like personality, she is very entertaining, would’t be hard to package her brand. With the right guidance Moody will be a guaranteed star. Bar for Bar, Trigga is one of the best in the city, he got his buzz in 2018 when he murdered FBG Slide remix. Any hot song with a dope beat, Trigga will remix it and fill it up with pure fire BARS!!! I would to hear more original music like his track Vent and Money & Murda. Trigga is a special talent, with an real deep story. Give him a listen and you’ll become an instant fan. The 19 rapper is filled with energy and excitement. Can’t really pin point it, but its something about Jasper, this kid got it. Young TeeTee is an artist that has been putting in a lot of work it and Its good to see it pay off. Cant really fully disclose all the information, but he might have a situation with Roc Nation. With that being said with those connections, 2019 is looking extremely certain for him. the first time I heard this kid I was at a studio session with my boy David, and I was played some of HBC music, I was immediately blown away. This 17 year old is the second coming of Kid Cudi. Warhol.ss is a talent that comes from other the Cole Bennett umbrella. His buzz kind of died down a tad bit in 2018, but look for the EMPIRE recording artist to make a bounce back in 2019. The Dreamville rapper has been very quiet throughout the years, but look for him to deliver some heat on the Revengers Album that is coming. Then after the Dreamville tape look for a solo project from the lyricist. I had the pleasure in conversing with him to know that he is not holding back any bars, he ready to provide straight heat. Sprado, is one of those talents that I almost slept on myself. Got the scoop from DJ D93, and almost overlooked it, but then DJ D93 is one of the best DJ’s I know. So if he vouches for good music, I had to listen. Sprado has a party record thats going crazy in the streets right now. 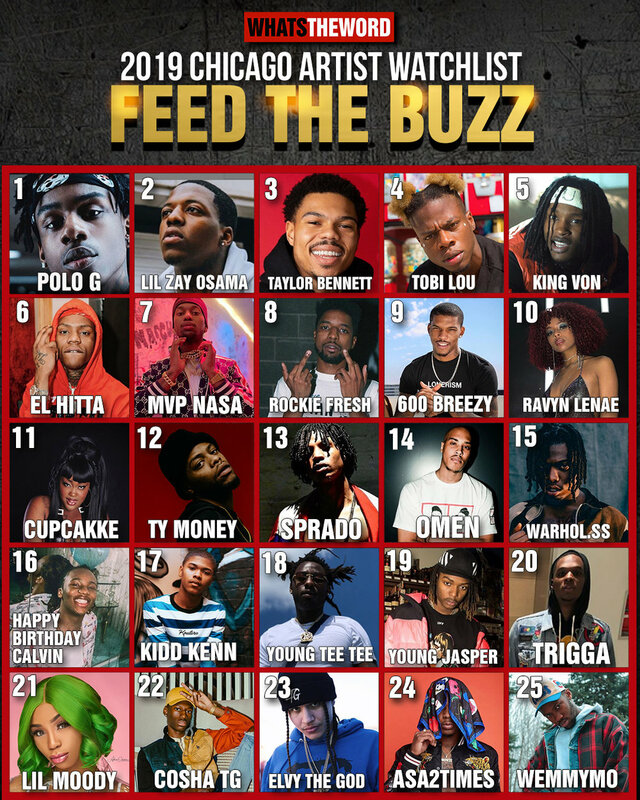 Ty Money should of been apart of the New Wave list, but he was in prison for majority of 2018. Since coming home TY Money has taken advantage of his BUZZ. With major co-signs from guys like Bump J and Nick Canon; the Sibley King is ready for war. There is no doubt that she has internet BUZZ, with her explicit lyrics and visuals . To many she is still viewed as satire, the challenge for Cupcakke in 2019 will be to make a smash record to take her out of the clubs and into arenas. Ravyn Lenae is the R&B/Soul diva Chicago’s been missing for years. She has the indie BUZZ, she has opened for SZA, and tour over seas. The Atlantic records artist is one hit record from being a house hold name. I would love to see he team up with Chicago artists like Tink and BJ The Chicago Kid to make some good chi-town hits. Fresh home from prison, Breezo wasted no time to release music. He blessed the streets with the First Forty Eight EP. Breezy had a nice BUZZ going before he went away, and dope relationships with guys such as Drake. Many thought he was going to sign with OVO. Looking for a fresh start I believe is going to pick up where he left off. Rockie Fresh’s BUZZ began when he signed with MMG back in 2012. In 2019 he has re-surged with a new single with Chris Brown Must Be. With all the support he has on his upcoming project, look for Rockie to make a huge impact this year. We might get killed for ranking MVP NASA this high, but he is potentially one of the biggest stars out of this group. I first heard NASA this summer when my fraternity brother Daren “DJ” Jackson featured NASA music as apart of his film score. Then months later DJ L sent me his music, by this time I’ve already been in tune with the artist, but L was the re insurance. The same vibes I got from 147Calboy and Juice Wrld last year, I get from Nasa. He has yet to get the attention he needs but with tracks such as Online (that we named one of biggest sleepers of 2018), he needs it. I predict Nasa BUZZ to pick up by the summer time, and by the end of 2019, everyone will know his name. The break through west side artists really took the city by surprise with his hit record Aww Yea. Hitta is a very humble individual and has a bright future in this industry. Signing a deal with Atlantic records and with OGs like Bo Deal assisting his career expect some good things from El Hitta. According to Lil Durk, King Von first track ever is the War with us record. That song is is at 1 million views. Then his Crazy Story Pt 1 video is at 11 million views on Youtube. King Von is the truth. Its amazing how raw of a talent he his. Once he gets a real hang of this rap game., he will be one of the biggest names coming out the city. He can surpass his class and predecessors like lil Durk & Chief Keef. Tobi Lou is probably one of the most skilled musicians in this new crop artists coming out of Chicago. Tobi Lou first hit our radar when he released the music video for Troop ft Smino. Then he has announced that his forthcoming debut album will be executive produced by veteran producer No I.D. Taylor Bennett is frequently known for being the younger to political hiphop star Chance The rapper. This could be tough for you Bennett, because many view him as Chance’s littlel brother woithout giving his music a chance. He even mentioned on a breakfast club interview last year that he was told that the world “doesn’t need another Chance The Rapper" . Its clear that the MC uses comments such as that as fuel. The Be Yourself and restoration of an American idol projects were just the beginning. This is the year Taylor Breakouts and makes his own name. Ouside of Soulja Boy, Lil Zay Osama had the biggest come back of 2018. Seriously, he was just released from prison for serving Juvenile life right when his rap career was about to take off. Since he’s been home he has gotten plenty of recognition from a lot of heavy hitters such as Meek Mill and Timbaland. Lil Zay Osama raps about the pain he has endured in the streets. Records such as Changed Up that hit 3 Million in less than a week, which illustrates that his messages touches people. Remember early G Herbo? the hunger and passion he delivered in every bar, is extremely similar to the vibes you’ll get when you hear Polo G. He is G Herbo on Steroids. His upside is amazing to be so young. Seems like anything this dude drops streams crazy on youtube. His Finer Things record is at 30 Million views on youtube, the Pop-out song featuring Lil Tjay hit 1 Million in less than 2 Days. He signed a deal in the 4th quarter of 2018 with Colombia Records. Polo G is the real deal.